This post uses the long wave radiation component documentation to illustrate how to upload documentation of components. The first operation made, after having used the appropriate template to write in LaTeX the documentation, and produce the pdf file was to upload the component to slideshare. For our internal use, we opened a new slideshare user called NewAGE-GEOtop-doc, at the address: http://www.slideshare.net/NewAGE-GEOtop-doc. The pdf file was named like the component itself, i.e. LWRB-linkers. 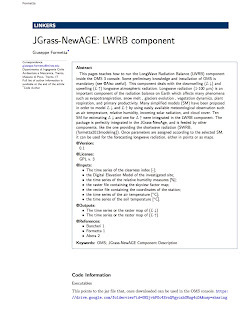 "Linkers" meaning that this documentation is for whom will use the component with others, and are, therefore able to write an OMS3 .sim file (documentation missing here, at the moment), described in the companion LWRB-ms (ms like "modelling solution") documentation file. The pdf has been subsequently loaded to slideshare for having a public repository. The Figure above is a ,jpg of the first page of the documentation file and clicking on it, the reader is redirected to the full file in slideshare. The jar file containing the component can be found here (missing link). The source code, as specified in the documentation file itself can be found, instead here.